I hung two wallpapers today, both from Anthropologie, and in both cases, the homeowner measured and purchased paper before I had measured and figured how much to buy. In both cases, they were a double roll short. I told them that when they ordered the extra double roll, to be sure to ask for the same run number as the rolls they already had. Unfortunately, in both instances, Anthropologie sent a different run. Probably, the guy in the warehouse didn’t get the message from the people in the order department, so he just pulled any old bolt of paper off the shelf. Run numbers DO make a difference. As you can see in the second photo, the butterflies are clearly different colors. And in the third photo, the color difference (red flower, brown leaf) is less dramatic, but still noticeable. The white background is probably a slightly different color, too. If these strips were placed next to each other on the same wall, you would notice an abrupt color difference the full height of the wall. 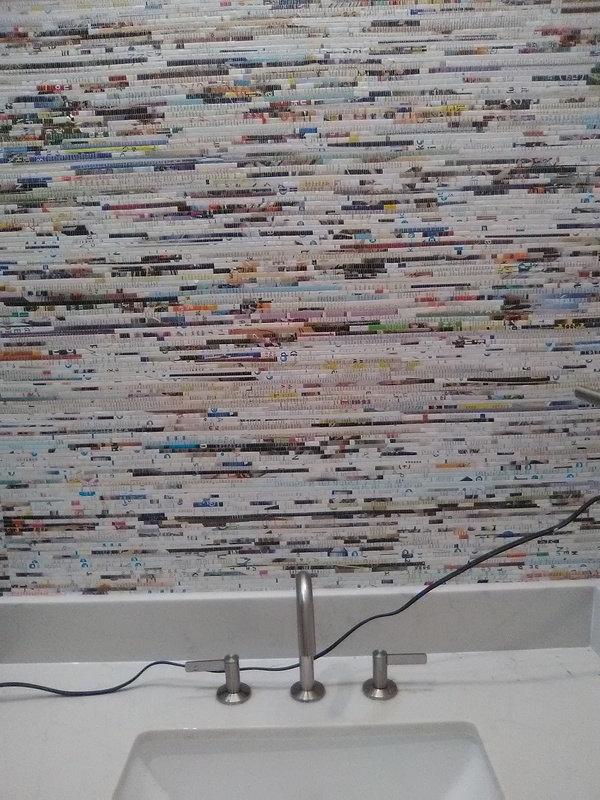 So it’s important to make sure that all your bolts of wallpaper are of the same run number. Run number, also called batch number or dye lot, refers to rolls that were all printed at the same time. 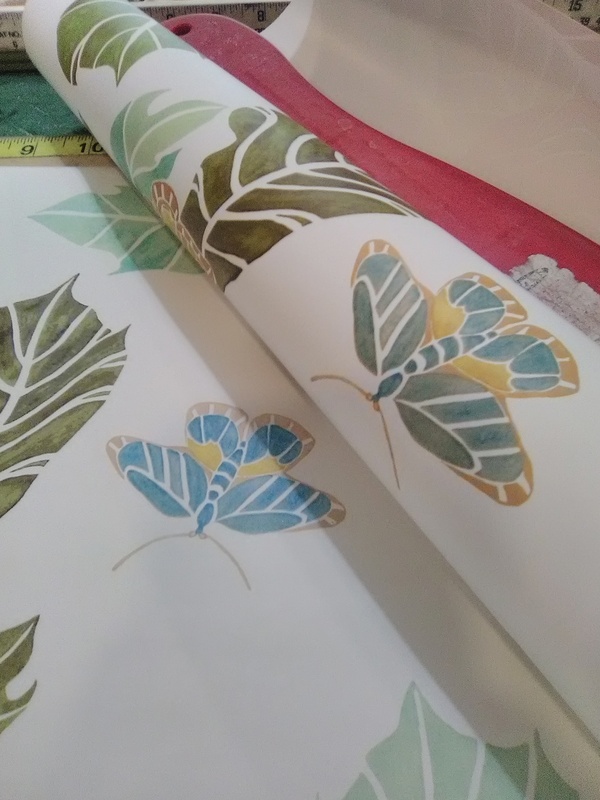 The next time the manufacturer is ready to print up that pattern, he will mix up a new batch of ink – but that batch might be a slightly different shade than what was printed previously. Because these color differences will be noticeable on the wall, it’s important that they not be used next to each other. You can use different runs on separate walls, but not on the same wall. If you are forced to use broken runs, as they are called, you’ll need to buy a little extra paper, because there will be more waste as you switch from one run to the other. Look at the center of the photo. See that slight color difference between the strip on the left and the strip on the right? This is most likely due to the two strips coming from two different run numbers. These can also be called batch numbers or dye lots. This means that all paper that is printed from one batch of ink is given a run number. Three months later, when the manufacturer is ready to print another lot of wallpaper, a new pot of ink is mixed up. Chances are that that new kettle of ink won’t be exactly-dactly the very same shade as what was used previously. 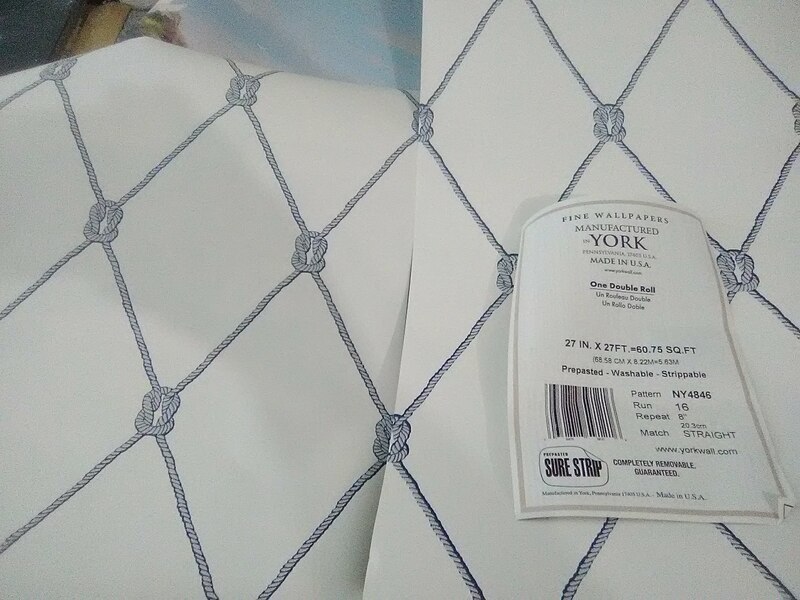 This means that the two batches of wallpaper will be ever so slightly different in color. If strips of paper from the two different runs are put on the wall next to each other, you will notice the color difference. So each batch of ink, and the paper that is printed with it, is given a run number. That way, the installer can be sure that all the wallpaper for his job will be printed at the same time, of the same run number, and all the same shade. Checking for run number is the first thing every installer should do, before starting to hang wallpaper. In fact, in my “how to prepare for install day” info pack, I ask my clients to check to be sure all bolts are of the same run number. That way, if there is a problem, there will be time to return the bolts and get new paper that is all of the same dye lot. If you end up with a broken run (two or more different run numbers), it is possible to use the paper, but you have to keep the different runs on separate walls… your eye will not notice a subtle color difference if the papers are on different walls. But this uses up a lot more paper. Need a Little Reading Material in the Bathroom? ?? What fun wallpaper! This is very similar to grasscloth. But, instead of using natural grasses and reeds, this material is made of strips cut from magazine pages, rolled and folded into long narrow strips, and then sewed onto a paper backing. In some of the columns, you can actually read the words! I hung this in a powder room in a new, contemporary home in the Rice Military neighborhood of Houston. The homeowner, Cristin Wells, is an interior designer http://www.wellsdesignedhome.com/ who recently moved here from Chicago (not far from my hometown of St. Louis! ), and brings her sophisticated playfulness here to the Bayou City. This product is similar to grasscloth in that the seams are very visible. So I engineered the room to have seams fall evenly spaced on each wall, which we call balancing, and which gives a pleasing effect. In addition, the material can be shaded, or paneled, which means there can be a noticeable color difference between strips, even if they come off the same bolt. In the third photo, you see how I have rolled the paper out on the floor, to check for shading / paneling, so the homeowner will be aware of this issue, and so I can plot how and where to use the various strips. Indeed, before consulting with me, the homeowner initially purchased two bolts of paper; when I measured the space I told her that she needed five more. The additional bolts arrived in a different run. Run and batch and dye lot numbers are important – all bolts from the same run or batch were printed at the same time with the same batch of ink, and will generally be pretty much the same shade. Papers from a different run will be a slightly different shade, and will be very noticeable if placed next to one another on the same wall. This is true even with this recycled magazine page material – see the third photo – although instead of printing with ink, the ladies who manufacture this stuff (usually in China or somewhere in Asia) are grabbing handfuls of magazine pages. As you can see, color variations are still quite possible / probable. In addition to the 10′ high ceilings, the room had a few features that made the install tricky. One was a deeper than usual vanity, which was difficult and somewhat dangerous to reach over to access the wall. This was also a “floating” vanity, which hung suspended on the wall with a short space underneath it that wanted to be covered with wallpaper. 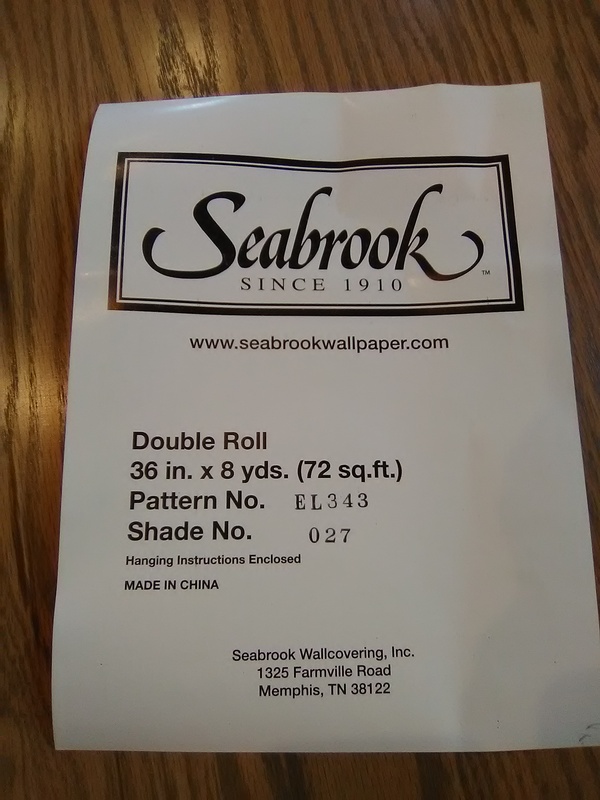 Contorting myself under a 30″ deep vanity into a 5″ high space to stick a couple of strips of paper to a rear wall that no one would ever see questioned my sense of reason – but I could not imagine leaving the wall unpapered, so I “got ‘er done!” Sorry, no photo. Being a contemporary styled home, the window was recessed with a 1/2″ return,. 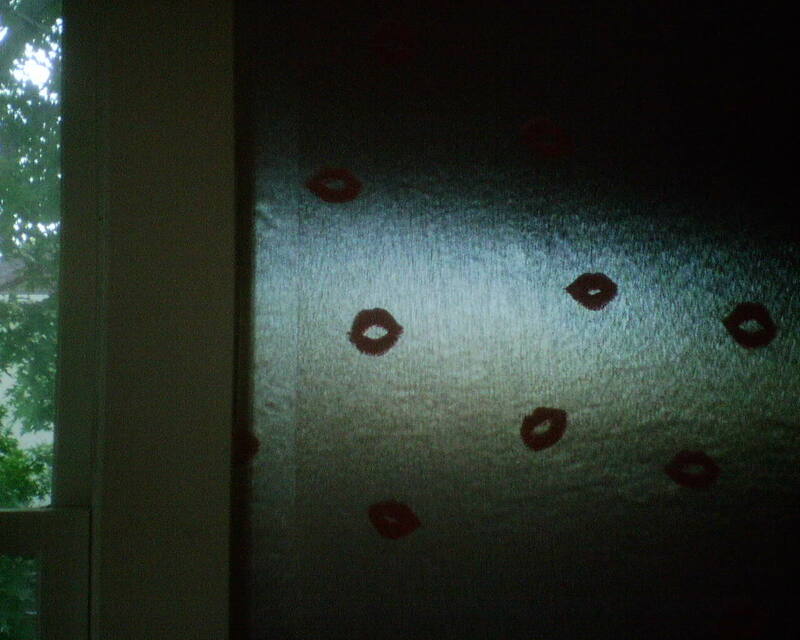 This meant that I had to bring the paper to the edge of the window, and then wrap a mere 1/2″ around an outside corner. The paper was thick and didn’t want to make this turn, and, when it did, it didn’t want to stay stuck – it kept trying to lift up. Wetting the paper helped soften it so it was more agreeable to making these turns, and in some areas I also used a razor blade to make light horizontal slits in the material, right on the edge of the corner, to reduce tension and allow it to turn more easily. Sorry, no photo. Speaking of making cuts … This stuff was thick and hard to cut, so it took a lot of pressure and several swipes to make many of the cuts, even with a brand new razor blade. When I trimmed the material horizontally at the ceiling and floor, the strings that held the folded magazine pages to the backing were cut also, and they came loose. That meant that there was nothing holding the folded magazine pages to the paper. It turns out that each of those horizontal strips of folded magazine pages contained about 6 layers of paper, each folded accordion-style. Threads were sewn on to hold them to the backing. But once the threads were cut, the accordion-folded papers unfurled, spread apart, and pushed away from the backing. So when you looked at the ceiling or floor lines, you saw a puffy ridge running the width of the strip. What I ended up doing was to go up to the ceiling and then down to the floor edges, gently pry apart the fanned layers, and use wallpaper paste to adhere them to one another. I had to get sufficient paste behind each of the six layers, for the entire 3′ width of each strip, press them back together, hold them until the adhesive tacked up – all without getting any paste on the paper or on the ceiling. All of the above added a lot of time to this job, and I didn’t leave until 9:30 p.m. But the room looked great when I was finished. From its initial uninspired dull grey paint job to the colorful and quite unexpected recycled magazine pages covering the walls, this powder room has experienced a major transformation. The wallpaper is by Seabrook, which has been purchased by York. Both are wonderful brands. One of the first things the installer does before starting a wallpaper job is to check the run numbers, to be sure it is the same for all the bolts of paper. This means they were all printed at the same time with the same batch of ink, so they will all be uniform in color. Both these bolts are from the same run. But look closely, and you will see that the blue lines on the strip to the right are darker and thicker than those on the left. If these two strips of paper were placed next to each other on the wall, the difference would be very visible. I am glad I noticed this before I started cutting any strips. I set aside the errant bolt, and hopefully won’t have to use it (I always have my clients buy a little extra, for repairs later and in case of instances like this). If I do need to cut into this bolt, the bathroom has a lot of choppy areas that are on separate walls where the color difference won’t be noticeable. The client bought her paper on-line, before I saw the job and measured the space. Like most homeowners, she ordered too little paper. I told her to get another double roll. The new roll was a different run number. In the photo, you see one is Batch 15, and one is Batch 16. And the label on the third double roll has been removed and discarded, so we have no way of knowing what batch that one is. 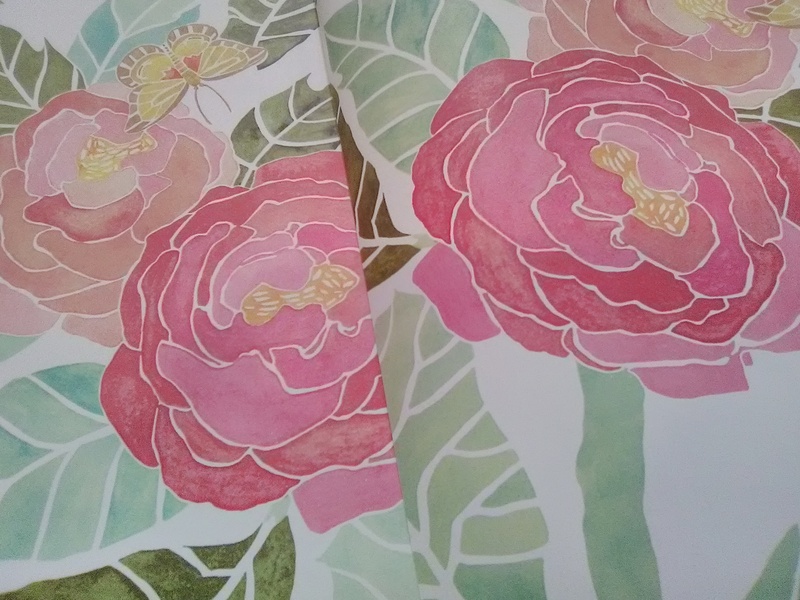 The problem is that each batch of wallpaper that gets printed will be ever so slightly a different color from every other batch. Not a problem if you can keep the different runs (batches) on separate walls. 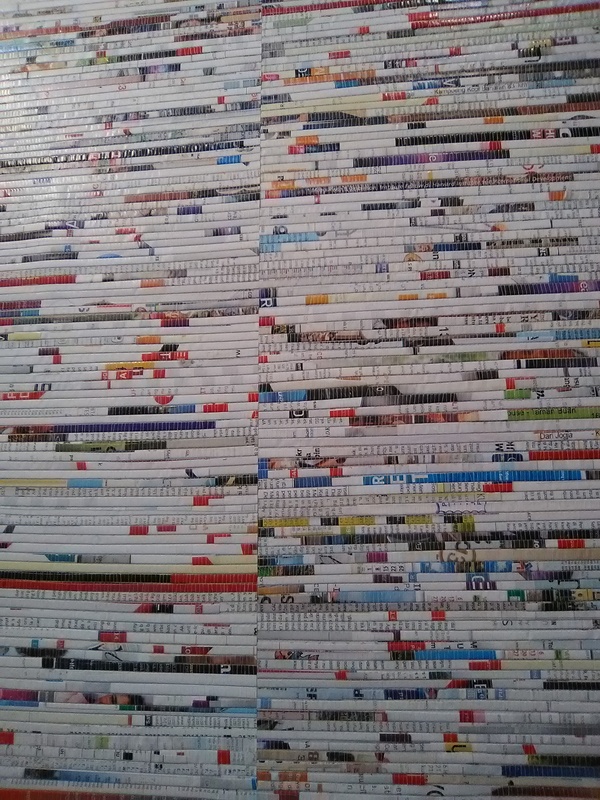 But if you have to put strips from different runs next to each other on the same wall, which is 95% of the time, you are likely to see a slight difference in color. This will make your wall look like it’s striped. Not good. 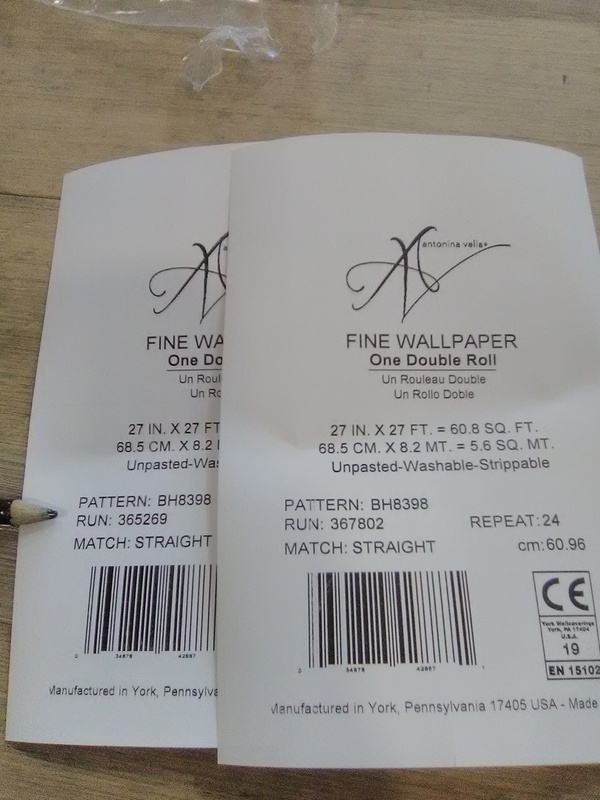 Buying wallpaper on-line can be cheaper and fast, but since people at the company are order-takers and are not wallpaper-savvy, there is noone checking things like run numbers. This is why I encourage clients to buy locally. 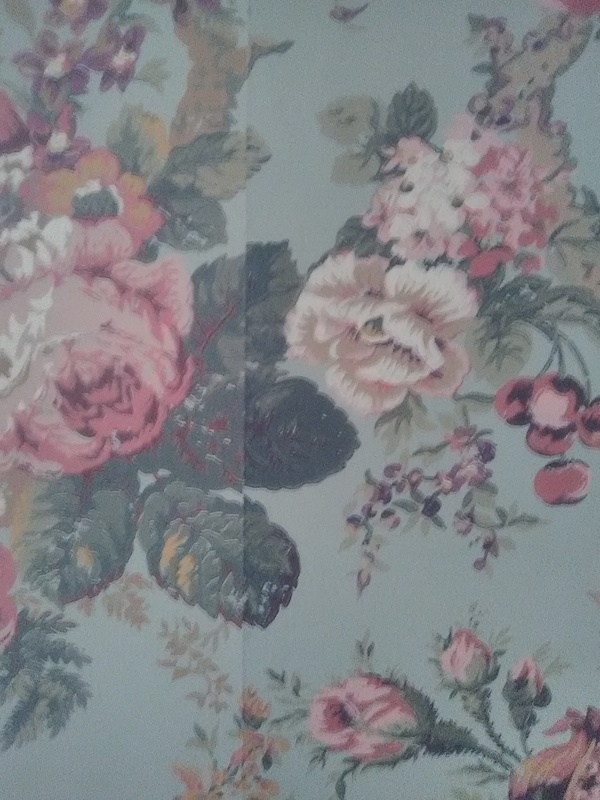 In my “Where To Buy Wallpaper” link on the right side of this page, I name several places where people really understand wallpaper, and so you can shop without having to worry about issues like run numbers. Look at the number right next to my pencil, and then look at the corresponding number below it. 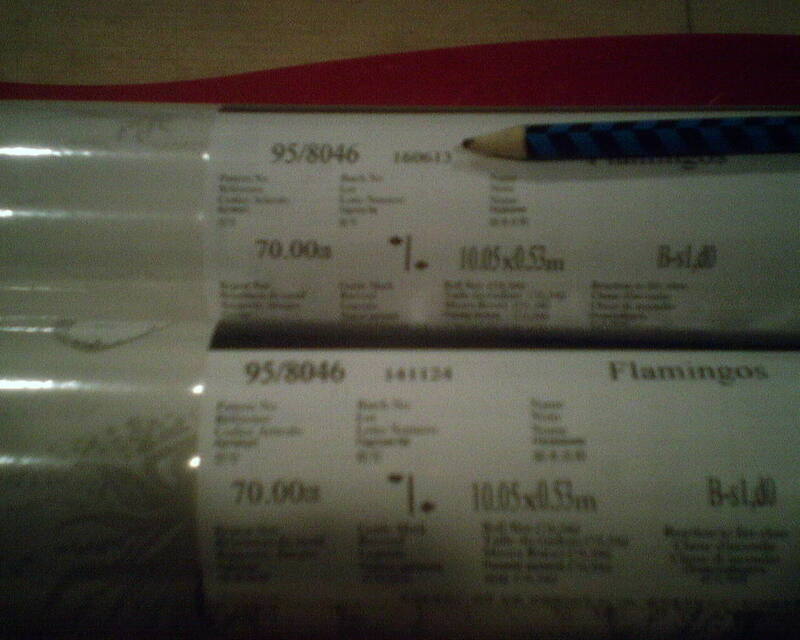 These two bolts of wallpaper have two different run / batch / dye lot numbers, meaning, they were printed at two different times, from two different batches of ink. This means that they can be slightly, or even VERY slightly different in color. But even a slight difference in color can be eye-jarring on the wall, when you have two 9′ strips of wallpaper next to one another. When I first consulted with this client, she had already bought some wallpaper – but she did not have enough to cover her wall. (Note to homeowners – always have the space measured by a professional before you order your paper.) So she ordered more – but the new paper that arrived was from a run different from what she already had. 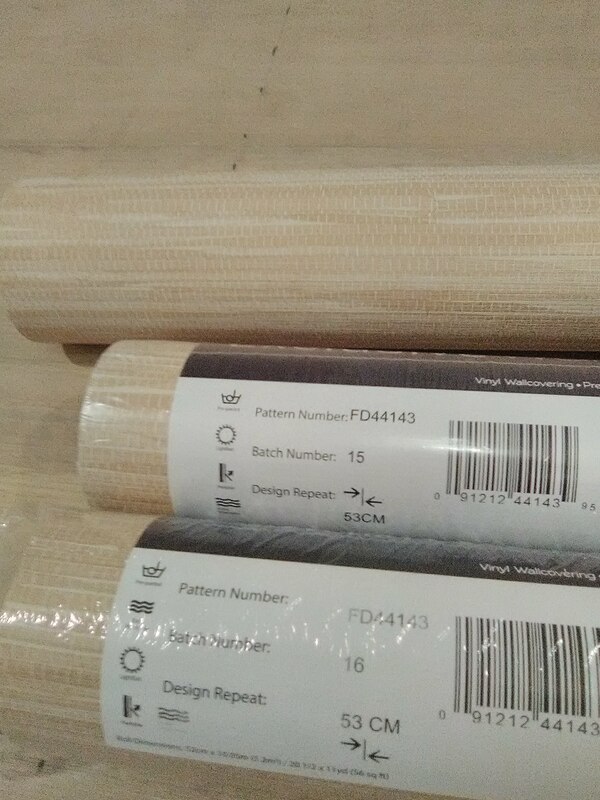 “Run” or “batch” numbers refer to when a batch of wallpaper was printed. Wallpaper printed at different times, and of different runs, will be slightly different in color. This slight color difference is what you see in the second photo, the thin strip at the left of the pic. Even if the difference is minute, full length strips side-by-side on the same wall can be quite noticeable. So, if you find yourself stuck with having to use different runs of wallpaper, you can disguise the color difference by “breaking” the runs in a corner…Because light hits the walls differently from one wall to the next, you won’t notice a slight color difference when the two different runs are on two different walls. However, it takes a bit more paper to do this. So, if you are dealing with two different runs, be sure to order one or two extra double-rolls of paper. I was called to do a repair (dog ate the wallpaper) on a dining room I hung about a year ago. 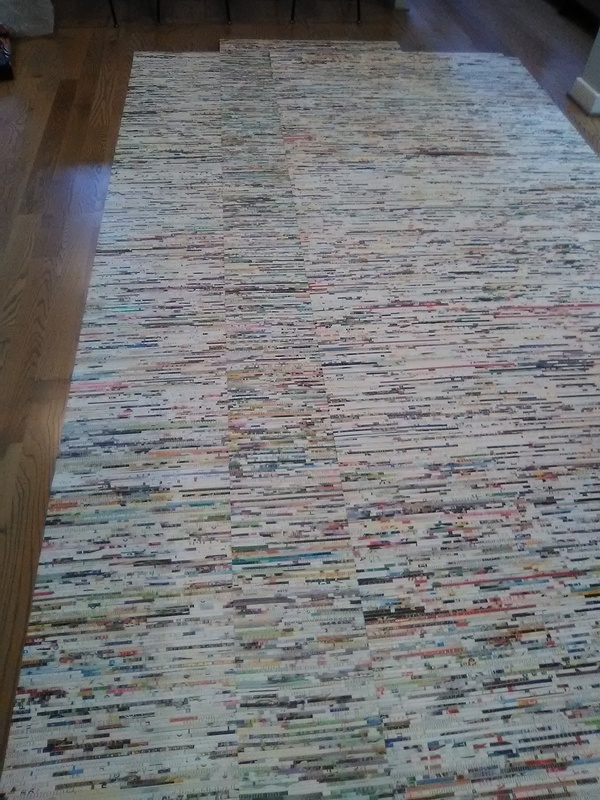 There wasn’t enough left over paper to replace the strip, so the homeowner had to order new paper. Since time had gone by, it was not possible to get the same run number. A run, or batch, number refers to all the bolts of wallpaper that were printed at the same time. 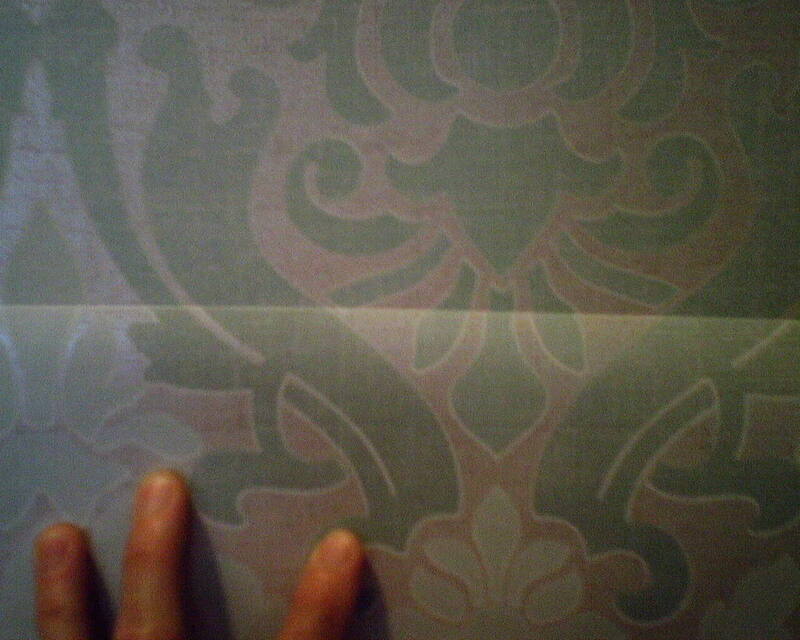 The next time they mix up a batch of ink and print wallpaper, it’s likely the color won’t be exactly the same. So it’s important to buy paper that is all the same run number. If not, there will be noticeable color differences between strips on your walls. Not good. Look at the photo. The darker element on the paper at the top is an aqua color. On the strip below, the color is more of a sage green. If you can’t get enough paper all in the same run to do the whole room, it’s OK to “break” the run in a corner, because your eye won’t notice the slight color difference, because lights hits each wall differently and changes the color a little. 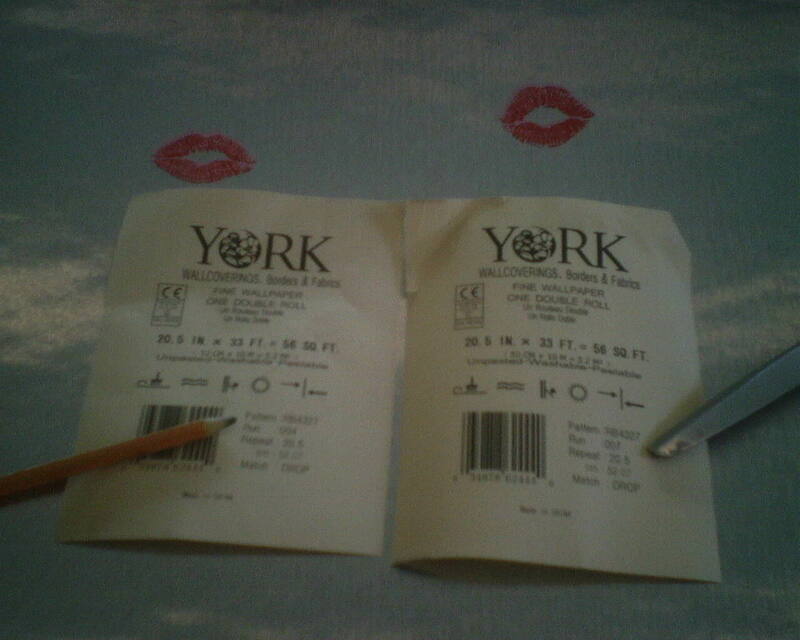 But know that you will also have to buy extra paper, when working with two different runs. Runs and Dye Lots … Have Me Measure FIRST! I recently did a bid where the homeowners already had their paper. The problem was, they had grossly underestimated how much paper they needed. They had a total of 5 single rolls, but the job actually called for something like 26. This is a special problem with their selections. They had chosen some quite pretty custom made, very high end papers, made to order out of state. The problems are many and are serious. Besides having to order quite a bit more of the very expensive paper, chances are the new paper will not match what they already have, so they will have to throw away that paper and buy even more. When paper is made, there is a “batch,” “dye lot,” or “run” number, meaning all the paper printed at that time came out of the same “batch” of ink. It’s important to use paper all from the same run. Papers printed at a different time from a different run will have a very slight color variation, because the dyes and inks were mixed at a different time. Will this matter? You bet! If you have to use a “broken run,” it’s best to keep different runs on seperate walls. You don’t notice a slight difference in color so much, because light hits one wall differently from how it hits another wall. The bad part about this is that if you have to split a strip of paper, as you often do, you can’t use half of the strip on one wall and then on the second wall, and then start with a new run, because the color difference WILL show when strips are next to one another on a flat wall. You can never put different numbered runs next to one another on the same wall – the difference shows as clearly as if you used strips of totally different colors. This means you end up having to buy even more paper, to allow for the difference in dye lots.